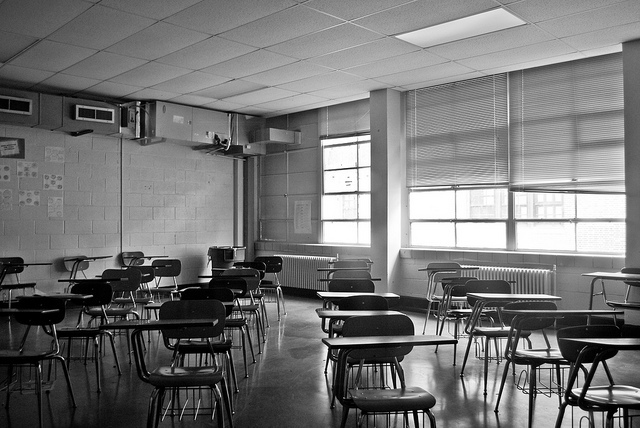 How Do We Keep New Teachers From Flunking? What type of teacher do we want? Teaching elementary or high school is not an easy job. But teaching teachers is tricky, too. Teacher preparation programs have to strike a delicate balance between theory and practice. And student teachers have to meet quantifiable measures of success (i.e. test scores) while inspiring far less tangible values like creativity and curiosity. In the U.S. today, this complicated approach to training seems to be misfiring, and has earned many critics—including the people coming out of teacher preparation programs themselves. Almost two-thirds of new teachers report that their training left them underprepared. Partly in response to this statistic, President Obama has tasked the Department of Education to develop rules to evaluate U.S. teacher training programs. But what should they be evaluated on, and what does it look like when they do their jobs right? In advance of the Zócalo/Arizona State University event “How Do You Make a Great Teacher?”, we asked teachers and education professionals: What are teacher preparation programs doing wrong? What can be done to better prepare teachers for the classroom? In discussing teacher preparation, the easiest thing to do these days is to blame teachers colleges. For decades, few people actually knew how to approach teacher education in a substantive way. On the one end, theorists wanted to dump a lot of philosophy and research on future teachers’ laps and hope that turns into better pedagogy for their students. On the other end, a lot of people wanted to kick traditional education programs to the curb in favor of more practical solutions—from teaching through a framework of semi-militaristic tricks to developing support networks with little pre-service training. What we don’t often discuss is whether we train teachers for the schools that they’ll have in front of them. In the search for the “perfect” teacher training, we forget that many teachers love—and learn from—just watching the teachers at their school. This should tell us that learning to teach is not necessarily about content knowledge, but a healthy mix of pedagogy and understanding how to work with students. Especially in schools with heavy concentrations of people of color, developing relationships and trust with students matters as much as content. If they don’t trust you as a person, they won’t trust you as a teacher. To better prepare teachers for the classroom, teacher education programs of all types ought to create and sustain support groups for the first three years of a teacher’s career, adapting to the needs and environments of the student teachers they serve. This is especially critical in technical subjects like math and science, where some students feel disconnected from the curricula. All programs need to find a way to balance theoretical, research-based knowledge with practical, real-world techniques that help teachers prepare for their first day in the classroom. No teacher is truly ready for the first day, but teacher preparation programs ought to assure that teachers have a solid foundation so they’ll not only feel some success in the first year, but they’ll stay in the classroom in the future. Jose Vilson is a math teacher, activist, and author of the book This Is Not A Test: A New Narrative on Race, Class, and Education. You can find his writing on his website at thejosevilson.com and follow him on Twitter at @thejlv. All of us learn on the job, especially early in our careers. But something is wrong when so many teachers say that the training they paid tens of thousands of dollars for didn’t set them up for success. Of course, not all new teachers feel this way. Those who are classroom-ready from day one are graduating from teacher preparation programs where instructors give them rigorous assignments and specific practical feedback on how they did. They get the opportunity to learn their craft from current teachers of proven effectiveness. Good programs have high admission standards, and see to it that their teacher candidates are steeped in the content they will one day be teaching. In a new report, “Easy A’s and What’s Behind Them,” the National Council on Teacher Quality shows that teacher candidates at more than 500 colleges and universities are 50 percent more likely to graduate with honors than their fellow students. When so many future teachers are getting great grades but are nonetheless finding themselves in over their heads in the classroom, that’s an indictment. School districts should hire graduates from those schools—and reward all their teachers, experienced and new, who succeed in one of the most difficult and important careers in the world of work. Kate Walsh is the president of the National Council on Teacher Quality, an organization dedicated to ensuring that all students have effective teachers. The assertion that nearly two-thirds of new teachers report that their training left them underprepared is an exaggeration of the fact that all existing types of teacher preparation need to be improved. Research clearly shows that there is tremendous variation in teacher education program quality. This being said, I believe that there is one area in particular where both university and non-university programs need to improve. Research has demonstrated that a great deal of distrust exists between teachers and parents that are often exacerbated by race and class differences, and that this distrust undermines student learning. Teacher education programs of all varieties have been guilty of neglecting to prepare teachers to work in respectful and productive ways with their students’ families. And new teachers aren’t always shown how to draw upon resources and expertise already present in their communities. Instead, all types of programs often “parachute” novice teachers into communities with the mission to “save” students rather than preparing them to work with and for communities to educate students. The result has been continued high teacher attrition and a lack of experienced teachers in many communities highly impacted by poverty. Currently, universities are accused of paying too little attention to practice, and new non-university programs are criticized for too narrowly defining teaching as technique and ignoring theory. This debate has diverted attention from reforms that can make a difference. Preparing teachers to be “community teachers” who understand and are able to work with their students’ families is one improvement in teacher education that is sorely needed. Ken Zeichner is the Boeing professor of teacher education at the University of Washington. He is a member of the National Academy of Education and a fellow of the American Educational Research Association. Given the rampant increase in high-stakes testing and accountability, schools have increasingly forced teachers to adhere to a form of teaching that is grounded on the assumption that the function of schools—and teachers—is simply to raise student test scores. As a result, teaching has been transformed into a profession that must be scientifically replicated through “best practices,” held to strict and myopic definitions of quality by way of student test scores, and most importantly, stay relentlessly focused on predictable outcomes. And so, training that does not idolize standardized forms of learning, and teaching will likely not “prepare” teachers adequately. I left the profession because this kind of teaching did not align with my beliefs about the function of teaching. Was I “underprepared” for a hyper-accountable and standardized world of teaching? Perhaps. But I’m thankful for that every day. Many pre-service training programs still work from the assumption that the function of teaching should position teachers as facilitators of student creativity and curiosity. But colleges of education are at a crossroads as never before. Constantly under threat of being replaced by popular alternative certification programs like Teach For America, who reinforce assumptions about the standardized function of schools and teachers, traditional education programs must decide what types of teachers our nation needs. A systematic revamping of pre-service programs to align with standardization will likely result in “better” preparing graduates for the classroom. But let’s start by first asking what types of teachers we want our students to have and the types of learning we wish to elevate. Only then can we have a conversation about whether prep programs are right or wrong in their practices. T. Jameson Brewer is a Ph.D. student in educational policy studies at the University of Illinois at Urbana-Champaign and associate director of the Forum on the Future of Public Education. He is a traditionally certified teacher with a B.S.Ed. in secondary education of history and holds a M.S. in social foundations of education. Follow him on Twitter at @tjamesonbrewer. I am proud to call myself a middle school teacher. I entered the profession through an alternative licensure pathway and started teaching just before No Child Left Behind went into effect. Needless to say, I wasn’t adequately prepared for my first classroom. My first groups of students helped teach me how to teach effectively—in many ways my training was on-the-job, trial-and-error work with adolescents. I see teacher preparation as a complex web of options. There are so many ways to enter the profession; it is difficult to hold prep pathways to common, rigorous standards. But I think a good start would be to shift from pathways that involve seat time, overemphasis on theory, and short-term student teaching experiences. Instead, we should focus on robust residency and apprenticeship models. I believe the best preparation for teachers is to spend lots of time in K-12 classrooms and schools—listening, learning, observing, planning, and teaching alongside experienced and passionate educators. Teacher preparation should focus more on long-term relationships between a mentor and pre-service teacher. And early-career teachers should be heavily supported with co-planning and co-teaching opportunities before they are expected to teach on their own. Authentic action research—conducted in real classrooms—should drive teacher preparation that is also modeled after the National Board certification process and will create classroom-ready teachers. Like a surgical resident who logs significant hours in the hospital, learning, practicing, and problem solving with peers and more experienced colleagues, pre-service teachers also need significant time in schools. Integrated into these communities, they can develop content and pedagogy knowledge, acquire a reflective mindset, take supported risks, and refine their teaching skills through practical experiences with other accomplished practitioners. Jessica Cuthbertson currently serves as a teacherpreneur, dividing her time evenly between teaching eighth-grade literacy at Vista PEAK Exploratory in Aurora Public Schools and supporting solutions-oriented efforts to improve Colorado’s schools with the Center for Teaching Quality. A passionate National Board Certified Teacher with 12 years’ experience, Cuthbertson is happiest when teaching middle school students, reading YA fiction, or writing a blog post. Teachers all intend to make a difference in their students’ lives. But 30 percent of teachers leave the profession in three years due to a complex combination of negative public perceptions, the conflicting demands of ever changing district initiatives, and an enormous variety of student needs. In high-need urban districts the average rate of attrition is 50 percent within three years. When asked why they left, teachers’ number-one response is job satisfaction. There are alternative teacher preparation programs transforming the process in three major areas: 1) increasing the time spent in schools and communities during student teaching; 2) providing a peer support network by creating a cohort model; and 3) offering personalized instructional support for three years after new teachers graduate. The first prong is easy to explain. The more time you have to practice, the better you will be at teaching. Most programs require student teachers to teach for 10 weeks. In alternative residency programs, student teachers are at a school site four days a week for an entire school year. This time gives student teachers context to understand the needs and assets of their school’s community. The teachers who focus on the assets of the community instead of its deficits usually thrive because they take responsibility for all their students’ learning. The second and third prongs provide new teachers with a coach who provides emotional and practical support. Often feedback is as simple as affirmations about the emotional turmoil of dealing with 30 to 200 different personalities on a daily basis. These coaches have a non-evaluative role and instead simply help teachers rethink their teaching strategies. This type of pedagogical support puts in the practice the expectations that teachers are also lifelong learners. Teachers can become isolated in their classrooms, spending weeks without a substantial conversation at work with another adult. Peer support counteracts that isolation, but it can only be possible if districts invest in partnerships with universities to create the infrastructure for novice teachers to continue to grow and receive feedback. Maria Chan is induction director at the Los Angeles Urban Teacher Residency initiative, a partnership with the Center for Collaborative Education and Cal State Los Angeles Charter College of Education.